"She was born too soon" –seven weeks early and weighs 1.7 kgs - the first message to the parents who should have been celebrating the birth of their child. Technology, medical science, care, and the hard work of medical professionals and social workers and NGO’s helped the pre-term and low birth-weight baby to survive! Many premature babies die within few days of birth. But thanks to each of the above she lived for several reasons. Maybe she was given critical and basic care in the first ‘Golden hour’ of birth, someone ensured that she was transferred to an appropriate Neonatal Intensive Care unit (NICU) or Special Newborn Care Unit (SNCU) where day and night the staff provided care in the incubators manufactured by companies who set standards of such equipments, where oxygen and warmth, nutrition and asepsis ensured her safe survival; the doctors used their skills that they attained during their training years , nurses washed their hands to avoid infection, and fed her at timely intervals to improve the body weight. After 28 days the little baby was strong enough to be sent home, but with lots of counselling to parents about further care over the next few months. In their efforts to ensure the pre-term baby’s survival, no one realised the risk factors associated with low weight pre-term babies. She was not born blind but then who stole her vision? Her vision was perfect for her age, the Retina was immature because in all babies it slowly matures in the mothers’ womb by 40 weeks, which is the expected date of delivery (EDD). Then what led to irreversible and needless blindness by the time she was three months old? What could be the plausible reasons? Was it the doctor’s lack of knowledge of Retinopathy of Prematurity (ROP) that needs to be checked and treated within 20-30 days of life? Or, the nurse who did not monitor the oxygen to low levels which can worsen ROP? Or the incubator suppliers and trained super-specialists who did not educate the untrained users that only blended oxygen should be supplied to preterm babies with strict control using pulse oxymeters? Or the Obstetricians who assisted in delivery administered preventive steroids to her high-risk pregnant mother or who gave oxygen at birth without checking with a pulse oxymeter whether it was required? Or could it be the fault of the duty doctor who discharged her from the NICU and scribbled ROP on the discharge slip without explaining to the parents how critical it was to check the baby’s retina within 20-30 days of birth and who did not fix appointment with a trained eye specialist? Are the parents to be blamed for not following the doctor’s advice? Or the eye specialist without proper training failed to see ROP in her eyes as it was not in the syllabus? Or the Retina specialist who was on vacation did not arrange a back-up to cover ROP screening in their absence? ROP develops 2-3 weeks after birth due to prematurity and low weight and then worsens due to many factors but can be fully treated by lasers if detected by proper retinal examination before 30 days of birth. If Retina check-up was done not later than 30 days, 90 per cent of her vision could be restored. Every day, doctors stumble upon such cases where helpless parents visit hospitals with babies who are blind due to lack of proper screening for ROP. On this World Prematurity Day, I hope everyone involved will talk about survival and vision. Let’s hope there are more people like Elizabeth Taylor and Bill Gates who took up HIV cause or Amitabh Bacchan to say “Tees Din Roshni Ke” like he said ‘Do Boond Zindagi Ke” to ensure rigorous ROP testing in all hospitals, maternity clinics, birthing suites, etc to restore the vision of babies who are at risk. J Venkateswarlu was a topper and a recipient of the National Merit Scholarship. A triple postgraduate and an MBA graduate, he was battling eye problems from age 10. He had always worn glasses and had undergone a keratectomy when in college to help stabilize his vision. Later in 1996, he underwent LASIK surgery in both his eyes, and his vision returned to normal. He had a cataract surgery in 2004 but in 2010 he was diagnosed with glaucoma. 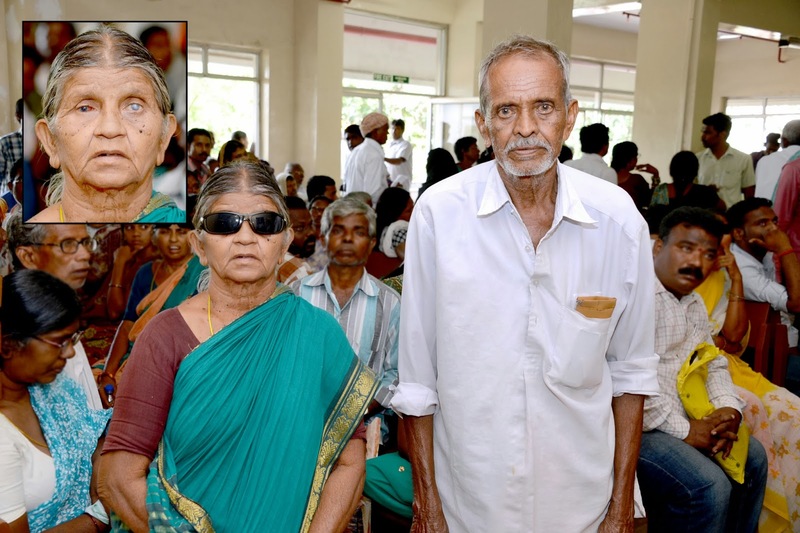 Deteriorating vision drove Venkateswarlu to visit several eye hospitals but to no avail. No one wanted to operate on him, because of his complex case history. That is when he came to LVPEI. In June 2011, Dr G Chandra Sekhar, Head of Glaucoma Services, tested his eyes and sent him to LVPEI's in-house Centre for Sight Enhancement (CSE). 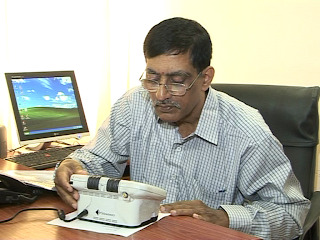 At CSE, Mr Deepak Kumar Bagga and his team counseled him about a range of low vision assistive devices such as magnifiers and computer software MAGic, but Venkateswarlu was upset since he was not prepared to live with low vision! He had expected to have his vision restored to normalcy after going to LVPEI. As he was a finance manager, he worked with worksheets, numbers, Tally software, etc. But increasingly, he was unable to manage his office work and thought of quitting. Towards the end of June 2011, he visited CSE again, without an appointment, and requested the staff to explain some more about the use of assistive devices and the portable video magnifier - Olympia. After over an hour of patient explanation, Venkateswarlu decided to use the Olympia magnifier to aid him in his work along with MAGic software. His MD saw the devices and advised him not to worry about losing his job any more. A grateful Venkateswarlu says. 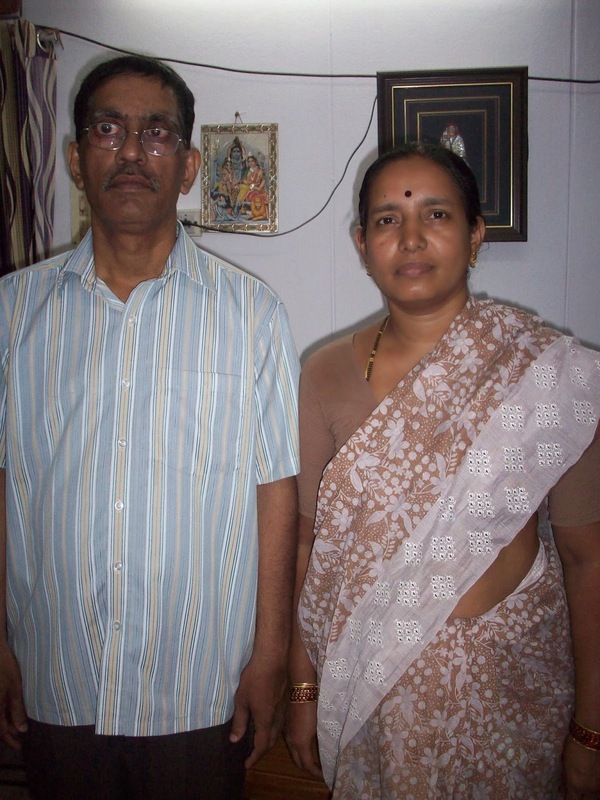 "I would have lost my job if Dr GCS and Mr Deepak did not help me at the right time." Dr Prashant Garg, Sarojini did well for five years. A graft rejection episode in 2007 necessitated a repeat corneal transplant. In 2013, there was a problem of blurred vision in the same eye, diagnosed as failed graft and she underwent Descemets Stripping Endothelial Keratoplasty (DSEK) corneal transplant, carried out for patients with persistent corneal swelling and poor vision. With DSEK procedure, only one of the innermost layers of tissue, the endothelium, and its membrane, the Descemet's membrane, are stripped off the cornea and replaced with a layer of healthy inner lining of a donor tissue. A thin button of donor tissue with only the endothelial cell layer is inserted onto the back surface of the patient's cornea. Post the operation, eye drops were prescribed and the happy couple is now on its way back to their village. The significant improvement in Sarojini's eyes has become a story of hope for many inhabitants of nearby villages.